South Island sheep and beef livestock transactions in recent months were generally low key, as is usually the case during winter. Mild climatic conditions through most regions and the lamb schedule rising to $8 per kilogram provided encouragement for farmers, which resulted in increasing demand for store lambs. This year’s scanning rates of in-lamb ewes throughout the country have also been positive, meaning few dry ewes are coming to the market. 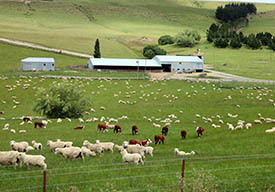 At a clearing sale in Otago in mid-August, good quality capital stock in-lamb ewes sold on average for $258 each. At the same time, records tumbled at the annual Marton and Feilding Hogget Fair, with a top price of $250 and an average of $185 across some 15,000 hoggets. In the North Island, Mycoplasma bovis made four-day calf sales difficult to predict. Calf numbers through the sales were down on previous years, though demand for top calves was solid. Below the premium level, volumes are lower, which could indicate stock shortages for the dairy beef market as spring progresses. Although plenty of farmers are seeking quality beef cattle, the kinder winter and the encouraging schedule give vendors the confidence to hold onto animals longer and maximise returns. As spring charges pastoral growth and feed takes off, demand for trading cattle will follow. Few store cattle came to the market in the last few months and, by October, they are likely to be keenly sought after. Deer farmers are enjoying record schedules, with velvet returns also strong, which is just reward for those in this sector who have patiently held firm over many years. Mycoplasma bovis hangs over the dairy livestock market, at least in some regions. Anxious to reduce the risk of infection, farmers are rearing calves themselves and calf rearers are going onto farms to buy feeder calves, rather than purchasing through the saleyards. Calving has progressed satisfactorily, though calves were dropping later in the Waikato, where it was a particularly wet winter. In most regions, farmers are reporting that cows have come through the winter in excellent order. After calving, they are therefore coming into lactation in good condition and milking well. While this provides a basis for confidence, as spring proceeds, the next step will be for the weather to deliver and pasture to take off, setting up a productive season. If so, demand for in-milk cows is likely to be high through the spring, although that could vary between regions, and timing will depend on when spring conditions really start in various parts of the country. Availability will be the key. If every dairy farmer is looking for in-milk cows, supply could be an issue. Dairy farmers are also enquiring early for service bulls for the upcoming season. On the back of Mycoplasma bovis, traceability and NAIT documentation are fully in the focus of purchasers, who need to be sure where a bull has come from. Farmers now effectively need a passport for any animal they intend to bring onto a farm.